One of the greatest products to ever make its way out of Cupertino was also one of the coolest and most practical. Which product am I talking about? 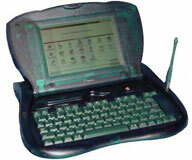 The eMate 300, put out by Apple in the doom and gloom days of 1997. For those who don't know, I wrote an article fully explaining what the eMate is, My Great New Writing Machine: An Old Newton eMate 300. What do you get when you put 10 or more of these little green monsters in the classroom? You get a guy who saw the potential in the eMate, so much so that his classroom uses them every day. Allen Pepper was kind enough to grant me a little of his time in an interview to tell the story of how he stumbled upon the eMate and what led to the phenomenon of having them in the classroom. Tommy: What did you think of the eMate when you first saw it and used it? Allen: I began teaching in 1998 as a special education teacher. At the time I was already an Apple enthusiast. I never had any experience with the Newton OS, but I began researching it at the time the eMate began its debut. I knew that I had to have one, but $800 was a little steep for me. Months after its release I found someone online that had one for sale at $300, so I purchased it. I began to use it for my grades and basic word processing. I fell completely in love with it and had the urge to want more. Tommy: Being that you're a teacher, did you instantly realize the potential in using eMates in the classroom? Allen: At the time I started teaching, my special education load was 5 students who had in their IEPs that they could use computers for their writing assignments. I purchased 5 more eMates and taught the students how to use them, and they were very successful in completing their assignments. I soon imagined what I could do with a whole class set. Allen: I knew that buying more eMates would not be cheap, but it would be worth it in the long run. I began to look online, mostly on eBay, for good deals. Occasionally there would be sellers that would have a set of 5 or 10 listed. I came across a recycling business in New York that had 25 listed. My only problem was how to keep them all charged with only 5 outlets in the room. I put out a want ad for eMate carts. I got a response from someone in Missouri that could get me two for $25 a piece. What a deal! We figured out how to ship, by Roadway, and it cost me less than $100. I had them delivered to the school. I remember pushing them both down the hallway, and several teachers were curious wanting to know if the school itself had purchased new laptops. I have looked on eBay ever since for more large sets of them and have several that need attention but will be worth the time and effort. Tommy: How did the students first react to using the eMates? Allen: The students loved the eMates and began arguing over who could use them from the start. I use them on the first day of school every year to get them enthused about my class and to see what fun Social Studies can be. We had it setup that every Friday they would complete a writing prompt and would always want to use them. It helps a lot, because they can keep all their documents there for future use and to see the progression in their writing. Tommy: What different things did you find for students to use on the eMates? Allen: I set each student up with their own account and password. On each cart, I have an Apple StyleWriter and LaserWriter, so they can print whenever they want. They use them when we go to the library to take notes for any project that they may have. They are able to make charts and graphs on them to include in their assignments. When they are finished with their work, they like to use the beaming function as an instant messaging tool. This feature really attracts them to the device - especially when they use it to print a document. Tommy: What was the driving force behind using eMates in the classroom? Allen: One day, surfing on the Web, I came across a teacher's website advertising that their classroom was called the "paperless classroom". They did all their work on other PDAs, which I had never used in the classroom before. I thought that the eMates would be perfect to do such, because of their instant-on capability, extreme portability, large screen, and easy access to your documents. By using them, I will have an "electronic portfolio" of their products. Tommy: Do you allow your students to take the eMates home? Allen: There have been a few occasions where a student would ask privately if they could take it home to finish a writing assignment. I would send it home along with a power cord and a set of instructions if there may be a problem. Eventually, I'm planning on having one for each student that they can use themselves all year. Tommy: Do you fix your eMates yourself or does someone aid you in keeping them up? Allen: Up to this point, I have fixed them myself . . . anywhere from rebuilding the battery to repairing or replacing the hinges. I actually got so good at it that I told a student that I could take one apart with my eyes closed, and he didn't believe me so I had to show him. The class was amazed. Tommy: What is it about the eMate that makes it an invaluable tool even today? Allen: The eMate has shown me that it makes a big difference in the students' writings. They are able to go back and make a change, whether it's to add or delete text or insert a picture or a graph. When they write on paper, they get frustrated when they have to rewrite something over to improve it. With the eMate, they can enjoy the process of typing while making a work of art that is unique. Tommy: Have you seen a comparable product that comes close to what the eMate provides your students? Allen: Many teachers today use Palm or Windows-powered PDAs. I have not seen these in use, and they may be very beneficial to the students. I have read that they do offer a lot more than the eMates, but their screens are still too small for me. I have seen teachers use AlphaSmarts, which are very close to the eMate's design. They are wireless and offer more applications that are centered around the students' learning processes. They are reasonably priced and run for many hours of use. I actually talked to a rep of theirs at a technology conference last year, and he gave me a tour of the AlphaSmart. He had never heard of the eMate, so I went out to my car and got mine to show him. He was quite impressed with it - and also sorry to hear that they were no longer made. Tommy: You have a website also - http://www.mrpepper.com. What all do you post on your website? Allen: I'm currently retooling my website to include everything that I cover in class for the year. There are sections for homework, class work, upcoming assignments, an online grade book if they want to check their grade, a discussion board, a quiz section, and finally, a page describing the eMates and how we use them in class. Tommy: For teachers who are considering different methods and using different technology to help their students - what would you tell them in regards to the eMate? Allen: The eMates are a good tool for students rather than a computer because of a number of reasons. The eMate allows students to be mobile, which gives them the freedom to write wherever they want. Students tend to become nervous when they have to sit next to their peers, as they may not work as fast as they do and don't want others to see that. Students can find a place in the classroom that will work for them which allows them to be more creative. Tommy: Are you a Mac user? Allen: My very first computer was an Apple IIe. I can remember my computer classes in school where we used them to write programs. I was impressed at the time and have owned an Apple in some form ever since. Tommy: Do you use Macs in the classroom? Allen: Three years ago, I started working in a brand new middle school. They supplied most of the teachers with four eMacs in their classrooms. This excited me, because I have used Apple computers since I first began to type. The students can log-on anywhere to access their documents or favorite websites. The teachers were supplied with iBooks, which many teachers didn't like. Due to a change in our tech department, they replaced our iBooks with desktop Dells for the upcoming school year. Of course, I'm not pleased. I managed to talk the principal into letting the school keep the iBooks, and I would set them up in a wireless setup traveling cart. Tommy: Where do you see the state of Apple in regards to education these days compared to the old days? Allen: Apple has come a long way in the computer industry. They have always had a place in education, as their operating system is user friendly. The new applications, iLife and iWork, allow students to be creative and to think outside of the box when it comes to making projects for a lesson. I don't see Apple ever leaving the field of education. Students feel connected to historical events when they use these applications to make projects that share their knowledge. Tommy: How long do you plan on using the eMates in your classroom? Allen: The eMates, in my opinion, are indestructible. Of course, there is the changing of the battery and reinforcement of the hinges. With these issues set aside, I plan on using them for a very long time. Tommy: Allen, I want to thank you not only for this interview, but also for finding such a great use for an equally great machine! It's clear to see the eMate was vastly ahead of its time, and its end came much too soon. If you have a story to share about the eMate, drop me a line at thomas (at) lowendmac(dot) com.